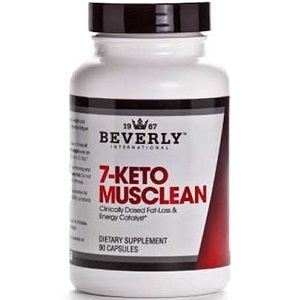 When you’re looking for a supplement to help you get into a state of ketosis you might be considering Beverly International 7-Keto Musclean. Beverly International 7-Keto Musclean contains a number of active ingredients, mostly derived from plants, that are designed to help its users to metabolize fat as a source of energy, which helps them to lose weight. We’ve assessed this supplement based on its ingredients and what level of customer service this manufacturer offers. All of the ingredients present in the supplement act in various ways to cause the body to break down fats and proteins as a source of energy. Many of them act directly on certain molecular switches in the fat cells of the body to cause them to break up their stored fat and release fatty acids. This is the biggest source for producing ketones for ketosis. These biomolecular effects make it easier to break down stubborn fat and to lose weight. We have observed that other ketogenic manufacturers have included preformed ketones in their supplement. The inclusion of preformed ketones helps to push the body into ketosis very quickly and to reduce the body’s reliance on carbohydrates as a source of energy. This manufacturer has unfortunately chosen not to follow that trend so it may take longer to reach ketosis when using this supplement as compared to some others. Beverly International 7-Keto Musclean is taken in a capsule form. Three capsules should be taken in the morning and three more capsules about 6 hours later. The manufacturer does not state whether the supplement should be taken with a meal or not but from our experience dietary supplements are best absorbed when taken with a meal. Guarana extract contains about 22% caffeine. The side effects of caffeine are insomnia nervousness headaches and nausea. Not every user will experience the side effects but some people are more sensitive to caffeine than others. Pregnant and nursing mothers and anyone who suffers from a chronic medical condition should strongly consider consulting a doctor before using 7-Keto Musclean. The price of 90 capsules is $45. This price does not include shipping or taxes. The manufacturer does offer free shipping for orders which are over $100 though. Beverly International does not seem to offer any bulk order discounts or subscription offers. The manufacturer offers a 60 day money back guarantee in which the customer will receive a full refund if they are unsatisfied for any reason. It is not mentioned whether this includes the shipping costs or not. The scientific research for the ingredients in this supplement is less convincing than for that of other ketogenic supplements, namely because this supplement lacks an ingredient called beta hydroxybutyrate, which is a ketone. Apart from that, there are some good qualities about this product – such as its affordable price and its guarantee. These qualities are not enough to grant it the space among the top ketogenic manufacturers though, because the supplement simply is just not as effective. Click here to learn about our Top Ketogenic Products. John Parker	reviewed Beverly International 7-Keto Musclean	on September 16th	 and gave it a rating of 3.